Matthew trained at The Royal Botanic Gardens, Kew. 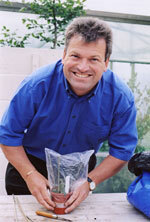 He has presented numerous television programmes, notably Channel 4’s ‘Garden Club’, stepped behind the camera to direct Meridian Television’s popular gardening series ‘Grass Roots’ and worked as Horticultural Consultant for a garden design series on Channel 5. He has written several books including the recently revised ‘Matthew Biggs’s Complete Book of Vegetables’ which has been translated into five languages. Matthew has also contributed to two Gardeners’ Question Time Books, ‘Plant Chooser’ and ‘Gardening Techniques & Tips’, and was commissioned by the Eden Project to write ‘Gardening at Eden and how to do it at home’. Matthew contributes to several magazines, including the Royal Horticultural Society Journal – The Garden, BBC Gardeners’ World, Countryfile and Gardens Illustrated and leads gardening tours worldwide. He lectures at the Royal Botanic Gardens Kew, Oxford University Botanic Gardens, the Cookery School of Michelin starred chief Jean-Christophe Novelli and is course Director of the Plants and Plantsmanship course at the English Gardening School. Matthew is also a regular panellist on BBC Radio 4’s ‘Gardener’s Question Time’.